Striking contemporary cuisine crafted with the finest local ingredients. 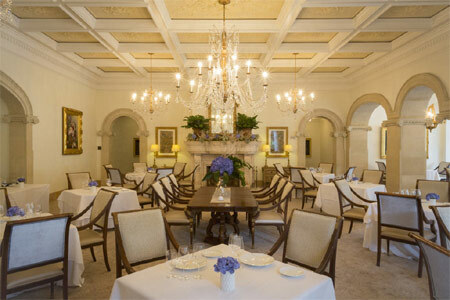 About the restaurant: When preparing to dine in this exquisitely turned-out room, keep your dressy attire handy. You'll want to reach for your sartorial best in anticipation of savoring the contemporary American fare of chef Julian Scheibel and crew. Service generally reflects a fine balance of professionalism and warmth. It's no wonder heads of state have graced these tables. About the food: The food highlights pristine foodstuffs from local suppliers and draws from regional traditions while bringing a sophistication to the humblest ingredient. Appetizers are apt to offer foie gras, perhaps in a “gateau” form with coffee, pineapple and blackberry sorbet. Entrées could include Wagyu striploin with grilled leeks, bone marrow, black garlic aïoli, chanterelles and potato, and first-rate fish, perhaps Atlantic seared halibut with corn ragout, carabineros shrimp and smoked corn sabayon. The cheese offerings will likely highlight local Sweet Grass Dairy choices, along with international selections. But sweet treats will appear as well from the hand of the pastry chef: soufflé with lime, white chocolate sauce and coconut sorbet; Valrhona chocolate cake with custard, sour cherries, amaretto and vanilla sauce; and crème brûlée with gooseberry, streusel, blackberry, raspberry and caramel ice cream. Tasting menus include seasonally inspired vegetarian and wellness options. About the wine: Wines chosen from the extensive, globally sourced cellar add greatly to the table's pleasures, and the correct service is appropriately passionate.